Like many fans, my introduction to the sweet science came from watching the highlight reel knockouts of Mike Tyson. A casual viewer at first, I soon became enamoured with the sport after watching such greats as Pernell Whitaker, Roy Jones Jr. and Lennox Lewis. Craving more, I decided to check out some of the great fighters of old. Every now and then, ESPN Classics would spotlight fighters such as Roberto Duran, Mohammed Ali or even Sugar Ray Robinson. Eventually, I came upon Smokin’ Joe Frazier. I had heard the name, of course, but had not seen any of his fights. They were showing his first fight with George Foreman – Kingston, Jamaica in 1973. I could still feel the electricity all these years later as the fighters entered the ring. Foreman looked mean enough, but Frazier looked positively menacing as he grinned up at Big George. Later, Foreman would admit that this was the first time he ever felt scared before a fight. I knew, then, before the opening bell sounded, that Frazier was going to be my favorite fighter. When the fight commenced, Frazier came out with his trademark bob-and-weave style. A style that no fighter has been able to duplicate, though Tyson came close. Relentless does not even begin to describe Frazier. He, quite literally, did not take a backward step. Foreman would not be denied, though. We all know what happened next. Frazier was annihilated. Six knockdowns in two rounds. Foreman seemed lazy with his punches, like they were thrown with no intentions. But this was an illusion. He had logs for arms and mercilessly battered the champion from pillar to post. The referee finally stopped the fight at the 1:35 mark of the second round. 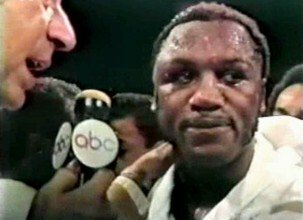 Frazier showed tremendous heart and would have gladly died, rather than quit. Warlike Frazier. He went out on his shield; an honorable loss, but painful to behold. Afterwards, I watched most of Frazier’s other fights. Before he met Foreman, Frazier had a brilliant career. Known for his devastating left hook, he fought, and convincingly defeated, virtually every top contender of his era. He scored a fourth round TKO over rugged Canadian heavyweight, George Chuvalo, a fighter famous for never being dropped in his professional career. He stopped Jerry Quarry in the seventh round in the 1969 Ring Magazine fight of the year. He, then, brutalized WBA champ Jimmy Ellis in four short rounds, knocking him down twice, to capture his first world title. He was never in a dull fight. Frazier’s finest hour, of course, was when he defeated Mohammed Ali by unanimous decision, in the first bout of their epic trilogy. That was the beginning of the most infamous fued in boxing history. Much has been written on the subject of Ali and Frazier. I cannot add anything new, but would urge the reader to check out ‘Ghosts of Manila by’ Mark Kram, the most thorough account yet written about this storied rivalry. There is also a fascinating documentary feature called ‘When the Smoke Clears’ which focuses mostly on Frazier. Frazier’s last meaningful fight was his final meeting with Ali in the ‘Thrilla in Manila.’ To this day, the fight is probably the most convincing argument against boxing as entertainment. It truly is a barbaric sport, where fighters are lucky if they can retire with their faculties intact. This fight, I believe, was instrumental in some of the later safety measures adopted, such as widespread use of mandatory eight-counts, the elimination of 15 round fights, etc. Many believe, myself included, that if the fight would have went one more round, somebody would have died. As fate would have it, Frazier’s corner stopped the fight. Some say Ali’s corner was about to do the same. We will never know. Truer words were never spoken. Thanks for the great fights, Joe.